The Tyre Pressure Monitoring System (TPMS) monitors the air pressure of all four tyres. If the air pressure of one or more tyres is too low, the system warns the driver by indicating the tyre pressure monitoring system warning light in the instrument cluster and operating a beep sound. 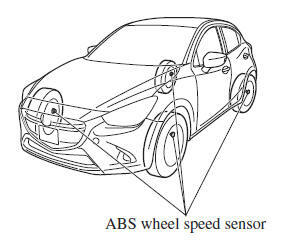 The system monitors the tyre pressures indirectly using the data sent from the ABS wheel speed sensors. To allow the system to operate correctly, the system needs to be initialized with the specifi ed tyre pressure (value on the tyre pressure label). Follow the procedure and perform the initialization. Each tyre, including the spare (if provided), should be checked monthly when cold and infl ated to the infl ation pressure recommended by the vehicle manufacturer on the vehicle placard or tyre infl ation pressure label. (If your vehicle has tyres of a different size than the size indicated on the vehicle placard or tyre infl ation pressure label, you should determine the proper tyre infl ation pressure for those tyres.) As an added safety feature, your vehicle has been equipped with a tyre pressure monitoring system (TPMS) that illuminates a low tyre pressure telltale when one or more of your tyres is signifi cantly under-infl ated. Accordingly, when the low tyre pressure telltale illuminates, you should stop and check your tyres as soon as possible, and infl ate them to the proper pressure. Driving on a signifi cantly under-infl ated tyre causes the tyre to overheat and can lead to tyre failure. Under-infl ation also reduces fuel effi ciency and tyre tread life, and may affect the vehicle's handling and stopping ability. Please note that the TPMS is not a substitute for proper tyre maintenance, and it is the driver's responsibility to maintain correct tyre pressure, even if under-infl ation has not reached the level to trigger illumination of the TPMS low tyre pressure telltale. The TPMS malfunction indicator is combined with the low tyre pressure telltale. When the system detects a malfunction, the telltale will fl ash for approximately one minute and then remain continuously illuminated. This sequence will continue upon subsequent vehicle start-ups as long as the malfunction exists. When the malfunction indicator is illuminated, the system may not be able to detect or signal low tyre pressure as intended. TPMS malfunctions may occur for a variety of reasons, including the installation of replacement or alternate tyres or wheels on the vehicle that prevent the TPMS from functioning properly. Always check the TPMS malfunction telltale after replacing one or more tyres or wheels on your vehicle to ensure that the replacement or alternate tyres and wheels allow the TPMS to continue to function properly. To avoid false readings, the system samples for a little while before indicating a problem. As a result it will not instantaneously register a rapid tyre defl ation or blow out. The size, manufacturer, or the type of tyres is different from the specifi cation. The size, manufacturer, or the type of a tyre is different from the others, or the level of tyre wear is excessively different between them. A run-fl at tyre, studless tyre, snow tyre, or tyre chains are used. An emergency tyre is used (The tyre pressure monitoring system warning light may fl ash and then continue illuminating). A tyre is repaired using the emergency fl at tyre repair kit. Load on the vehicle is applied to a tyre such as by loading heavy luggage to one side of the vehicle. System initialization has not been implemented with the specifi ed tyre pressure. A tyre pressure is adjusted. The tyre pressure monitoring system warning light is illuminated. Park the car in a safe place and fi rmly apply the parking brake. Let the tyres cool, then adjust the tyre pressure of all four (4) tyres to the specifi ed pressure indicated on the tyre pressure label located on the door jamb of the driver's door (door open). While the vehicle is parked, press and hold the tyre pressure monitoring system set switch and verify that the tyre pressure monitoring system warning light in the instrument cluster fl ashes twice and a beep sound is heard once. If the system initialization is performed without adjusting the tyre pressure, the system cannot detect the normal tyre pressure and it may not illuminate the tyre pressure monitoring system warning light even if a tyre pressure is low, or it may illuminate the light even if the pressures are normal.